Donate to Kaye Beach's legal defense fund here. BTC UPDATE: 6:14 PM -- A tax based on newly proposed license requirements has been approved, an insider source disclosed. Newly added taxes have precipitated a late veto from Governor Perry in the past. A 2nd Texas special session is being discussed around the capitol aimed at Governor Perry's unfinished business and the viscerally contested nature of SB 1's requirement for citizenship at Texas MVD windows. It was also said that the intent to move identity demands forward on the part of Tommy Williams went beyond the norm. A conferencing process to update or reconcile bills passing both chambers typically is the last administrative agreement on a legislation before moving a bill to the Governor's desk. Williams was said to have plans to add citizenship requirements amendments post-conference; which was a process the source had doubts about based on legislative rules. Other items discussed were a merger of motor voter rolls with database requirements. BTC - Popular Science, an online tech magazine, reveals the panoramic divide facing the National Strategies for Identity in Cyberspace proposal which held its first privacy centric workshop at MIT Cambridge Monday and Tuesday of this week. "It'll save us money and provide secure (yet optional) ways to do our online banking, healthcare, and taxes." "Internet IDs will be ineffective, risky, and won't address the root of our real problems with online security." "If you cowards won't protect us, we'll protect ourselves!" This was a neat comment on CNet's Privacy Inc. following a story about Marsha Blackburn's duality on net regulation c/o Mickey White. "Why does Marsha Want Congress to Regulate the Internet? Why not just say NO FEDERAL branch (the FCC and congress and the federal courts included) has any authority to decide or rule on any aspect concerning the Internet? BUT Marsha Blackburn did Vote FOR: Patriot Act Reauthorization, Electronic Surveillance, Funding the REAL ID Act (National ID), Foreign Intelligence Surveillance, Thought Crimes "Violent Radicalization and Homegrown Terrorism Prevention Act, Warrantless Searches, Employee Verification Program, Body Imaging Screening, Patriot Act extension; and only NOW she is worried about free speech, privacy, and government take over of the internet. " Remember the REAL ID Act, the federal government’s attempt to create a national identification card through state driver’s licenses? 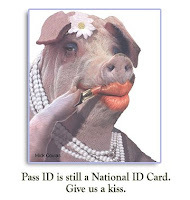 REAL ID never was carried out because 14 states refused to comply. The Supreme Court has ruled the 10th Amendment prevents the federal government from “commandeering” or forcing state officials to implement federal policies. In “Federalism DIY,” author Nick Dranias writes there are many other areas where the federal government has fooled states into helping to carry out federal mandates when they don’t have to. BTW...You still have time to help OKie Kaye Beach out of her driving-while-unrenewed case. You are ill advised to volunteer any personal information on a poll like this. 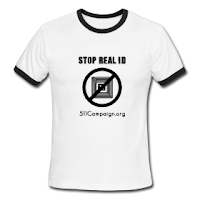 Real ID is not "a reality". It now comes in the veiled or non-combative reconstituted form of "secured licenses" or "come to the DMV to renew your licenses today!". Over 25 states have legal bans against the regulations and some of the technologies in Real ID licenses. If you ask Heritgae or Center for Immigration Studies, who want North American population and movement limitation control so badly they may have spent money on this consumer poll - the answer will be YES. If you go to DHS the answer will be No. If you contact your State Attorney General's office you will get the real answer. Ask if your Governor has submitted a letter, along with the Attorney General, to go along with the Real ID citizenship requirements or grant requirements for the federal program. Then ask if the DMV is moving ahead with any regulations to self-certify with the Real ID benchmark deadline January 15, 2013. Write down whatever they tell you. Please report your findings to: contact@beatthechip.org. We will assemble a spreadsheet of States who have both bans against the Real ID Act and whom are entertaining regulatory compliance. These States may be breaking their own laws and should be held accountable to the State constituencies they serve. From there we will be in contact with national advocates who are also lawyers or members of the National Lawyer's Guild to assess results of the findings.